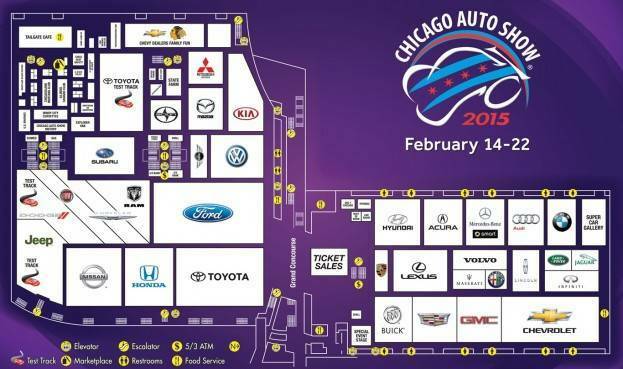 The 107th annual Chicago Auto Show opens to the public on Valentine’s Day and if you and your sweetheart are car enthusiasts, this is the perfect date. Here is a preview and a look back at the luminous history of The Chicago Show. The Japanese automaker is paying forward with their “Walk In My Boots” campaign. In conjunction with The Salvation Army Evangeline Lodge in Chicago, Toyota will help provide new boots and socks for families during the cold, Illinois months. The Salvation Army Evangeline Lodge houses upwards of 60 families per night, provides food, tutoring and job placement services to those in need. Toyota Motor Sales USA plans to donate an additional $15,000. Toyota will reveal updated versions of the Avalon and Tacoma while hosting two different ride and drives. Santa Cruz Crossover Truck Concept will be the talk of the town. I spotted it at the North American International Auto Show last month here in Detroit and it looks pretty slick. 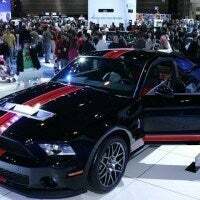 The idea is to offer younger buyers an automobile that is flexible. The Santa Cruz Crossover Truck Concept looks professional for that business luncheon but is rugged enough to handle treks to the campsite. 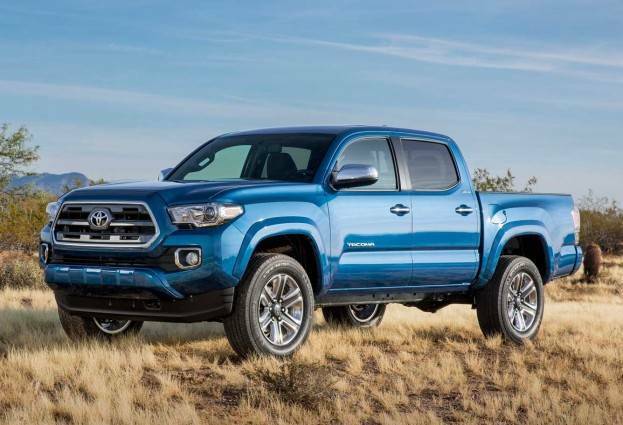 An environmentally mindful, 2.0-liter turbo diesel powers the rig. 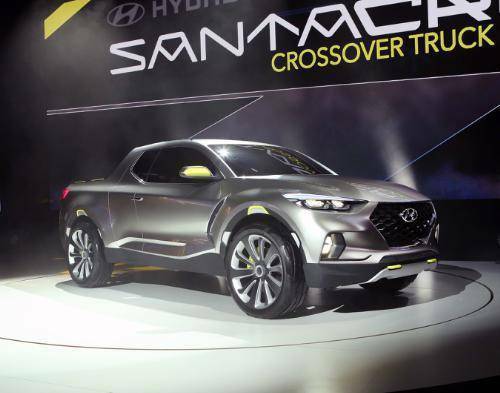 Santa Cruz Crossover Truck Concept at the 2015 North American International Auto Show, Cobo Center, Detroit, Michigan. Supposedly, they are planning on showing a new Ram but no word on specifics. The Ram, especially in its Eco Diesel format, is renowned for its balance of fuel economy and power. The awards and accolades in 2014 probably forced Ram to build a bigger trophy case. My observation convicts me on this point: the EcoDiesel’s success comes largely from the TorqueFlite as its construction does a stellar job dispersing and dispensing the 420 lb. ft. of torque from the 3.0 engine. 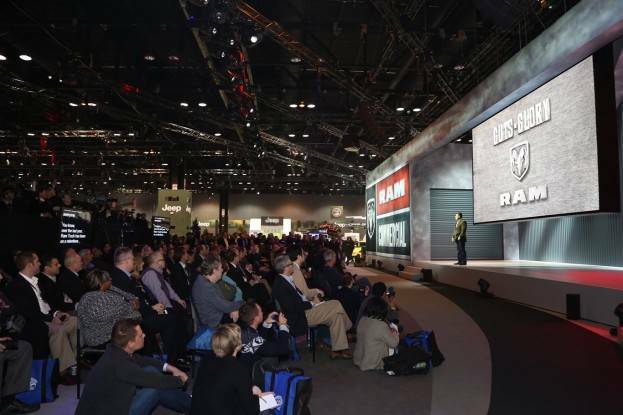 The Ram press conference during the 2013 Chicago Auto Show. The GT-R LM NISMO race car is sure to warrant a loving gaze or two – the one “dad” was driving in the Super Bowl XLIX commercial. Also appearing: the 600-horsepower Nissan GT-R NISMO, the 370Z NISMO, Juke NISMO and a concept Sentra NISMO. According to Nissan, the NISMO brand is built on power, agility and technology and Chicago will be a fine place to witness the next generation of those three elements. The Dearborn, Michigan automaker will display their new police Interceptor, based on the Explorer. One of the Explorer’s engine options is the a 3.5 EcoBoost creating 365 horsepower. We know from watching Ford’s evolution over the last 4-5 years, the EcoBoost is nothing to mess with. So, don’t try and outrun Johnny Law with your clunker or you will most certainly end up in the clinker. Ford’s exhibit at the 2014 Chicago Auto Show. In line with the aforementioned Interceptor, NRSF is hosting a video contest focused on the dangers of texting and driving. Teenage motorists were encouraged to submit ideas for a TV commercial about the hazards of using a cell phone behind the wheel. The winner, who will be announced at the Chicago Auto Show, will have their script produced into a nationally broadcast public service announcement. The National Highway Traffic Safety Administration attributes 3,000 deaths each year to distracted driving. – More than half of the attendees said they planned to purchase a new vehicle within one year. – 60 percent of attendees were male, 40 percent female but the percentage of female attendees continues to climb. 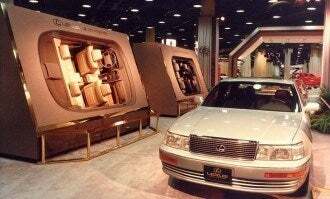 – Attendees spent an average of 4 hours at the Chicago Auto Show. 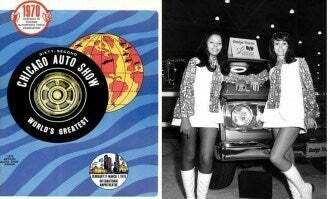 – Nearly 200 plus hours of radio programming were dedicated to the 2014 Chicago Auto Show. 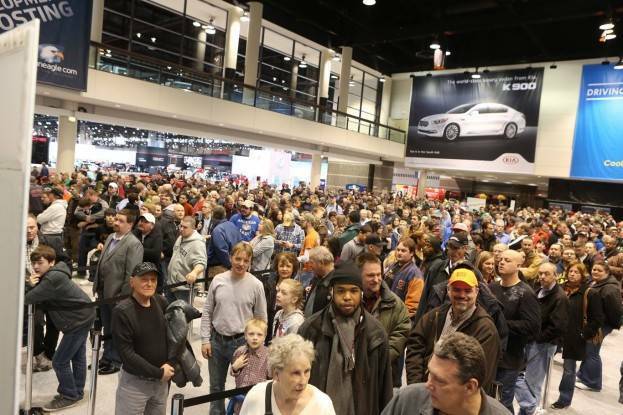 – 3,300 journalists covered the 2014 Chicago Auto Show. 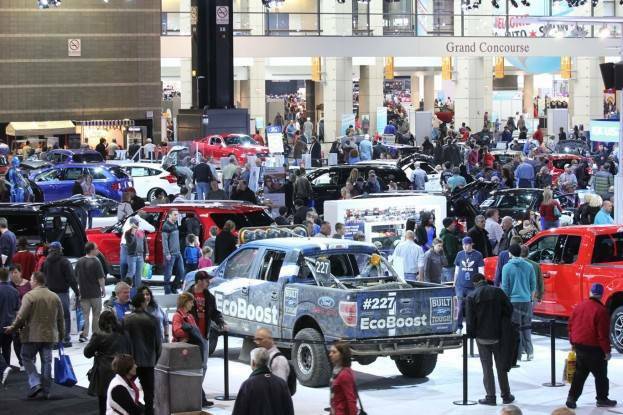 – 21.5 million social media impressions were sent out at the 2014 Chicago AutoShow. – Chevrolet won Best Exhibit while the Ford Mustang grabbed Best All-New Production Vehicle honors. 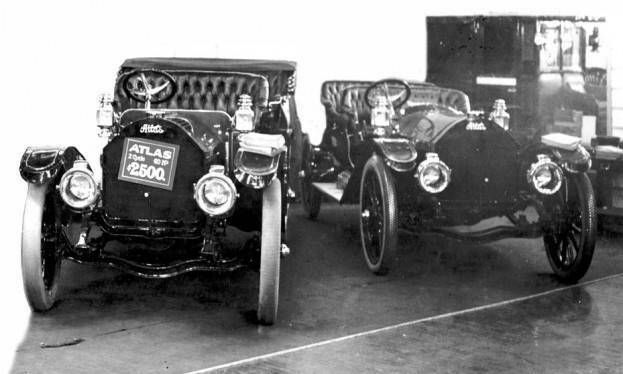 – 1910: 78 different makes of automobiles were displayed and these Atlas cars were part of the bunch. The two-cylinder, 60 horsepower machines could be purchased for $2,500 in those days. 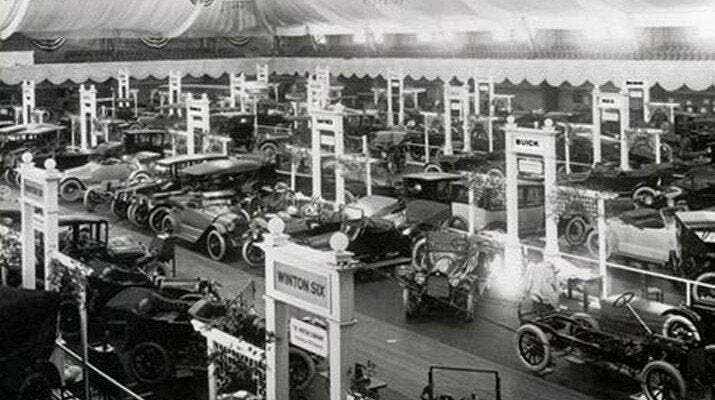 Thomas Jeffery & Company and Hudson Motor Company also commanded a presence at the 1910 Chicago Auto Show. 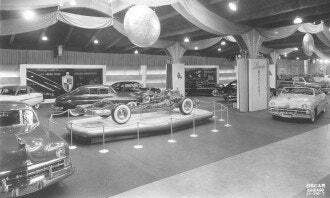 Atlas cars at the 1910 Chicago Auto Show. 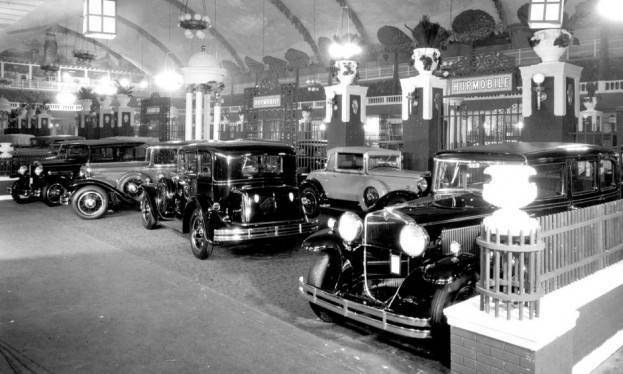 – 1930: Hupmobile showed their line up at the Chicago Coliseum. The Hupp Motor Company, despite periods of solid sales, never gained long term traction. Company leadership disagreements, production delays and fallout from The Great Depression caused a cease of all operations by 1940. The Hupp Motor Company was based in Detroit, Michigan. 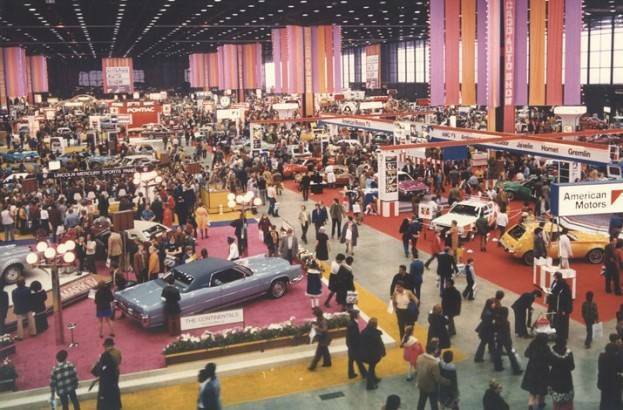 – 1950: Chicago welcomed the first automobile show in the United States since World War II. 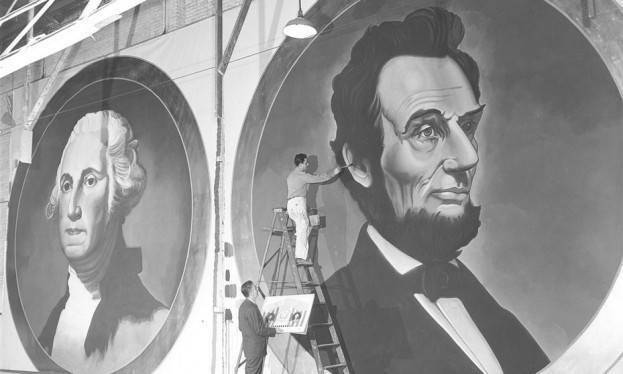 The International Amphitheatre saw nearly 480,000 visitors for the event dubbed “Wheels of Freedom.” Detailed portraits of George Washington and Abraham Lincoln were turned into curtains for the “Wheels of Freedom” stage during the 1950 Chicago Auto Show. Chevrolet’s Powerglide automatic transmission, Studebaker’s Champion Convertible and a Willys-Overland Jeepster Phaeton were also points of interest. 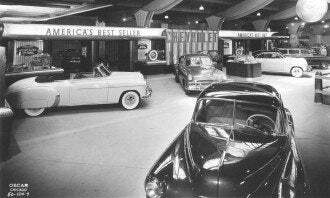 Chevrolet exhibit at the 1950 Chicago Auto Show boasting the namesake as America’s top brand. With elegant dresses and jewelry, Community Queens commanded as much attention as the cars in 1950. Community Queens are equivalent to the models, presenters, Brand Ambassadors and Right Seat Hosts seen at auto shows today. 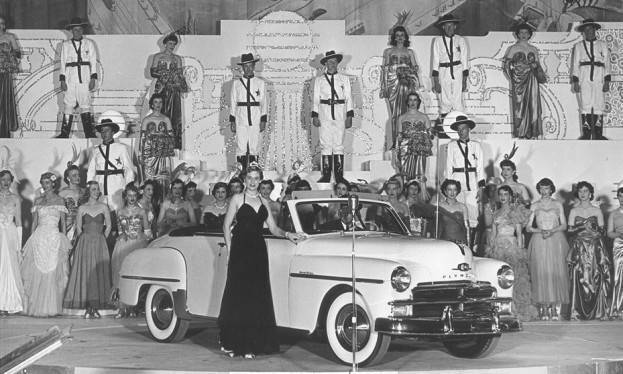 A Community Queen poses before a 1950 Plymouth Special DeLuxe as members of the Frank Bennett Singers stand behind. – 1970: Pontiac unleashed the redesigned Firebird, Oldsmobile sported its Rallye 350 and Dodge their D300. 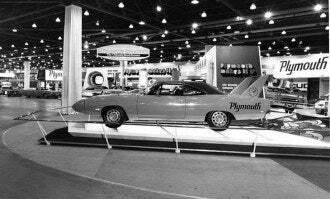 Weather was mild by Chicago’s standards for February but Plymouth and Ford took the International Amphitheatre by storm – Plymouth with their Superbird and Ford with the Torino GT. The 1970’s had fashion unlike any other era but Dodge really lived it. Had I been alive, I would have rocked a Challenger; my potent charm further accentuated by a plaid patterned, polyester coat and a little Barry Mainlow on the radio. Even the most resistant lady would soon be enticing me for a ride in an attempt to forge an inquiry about my long-term relational commitment status. 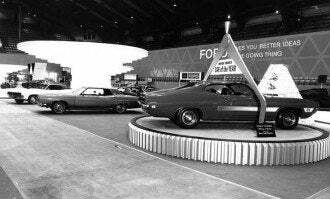 A Dodge Challenger at the 1970 Chicago Auto Show with all the furry extras. 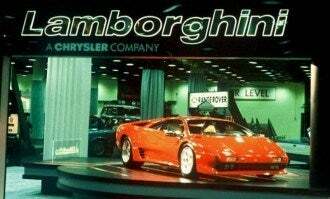 – 1990: Lamborghini unveiled their Diablo and its flashy red lit up McCormick Place. 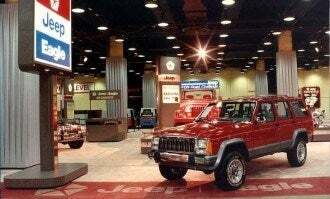 Jeep also sported a red outfit courtesy of a Laredo trim Cherokee. Mitsubishi showed their Eclipse and Toyota introduced Lexus for the time to the 980,000 plus attendees. 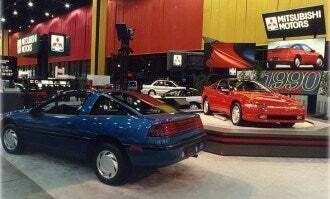 Red certainly was the color of choice for the 1990 Chicago Auto Show. 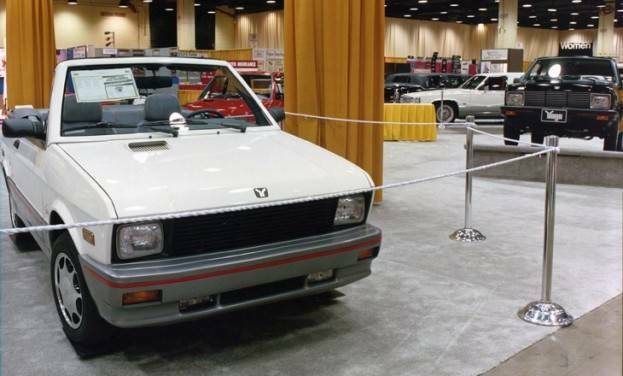 Yugo made an appearance too but economic sanctions and penalties from The Environmental Protection Agency limited their advancement in the US market. Yugos, however, are still popular in Serbia where they are often converted to Liquid Petroleum Gas. 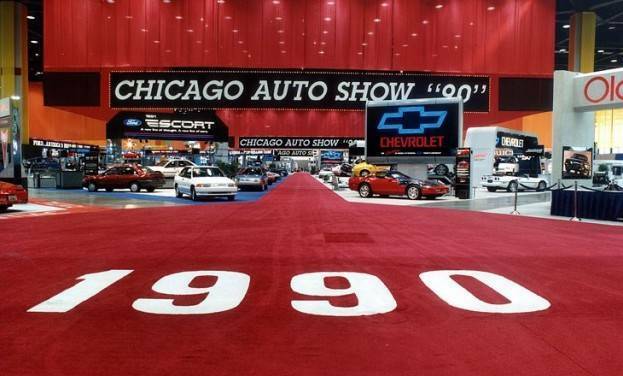 Yugo display at the 1990 Chicago Auto Show. 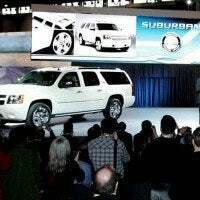 – 2010: Chevrolet hit a milestone as Suburban was the first automobile to see 75 years of production. GM celebrated with the 75th Anniversary Diamond Edition Suburban, decorated in LTZ trim. 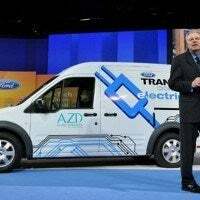 Ford introduced their Transit Connect Electric that could travel 80 miles on a full charge while their 540 horsepower, DOHC V-8 Shelby GT stole hearts and captured imaginations. Mercedes-Benz was not silent at the 2010 Chicago Auto Show. Their SLS AMG hit 60 in 3.8 seconds and boasted a 6.3 liter, 563 horsepower engine, married to a seven-speed dual clutch transaxle. The exterior is light weight aluminum, making for excellent handling and optimum power to weight ratio. 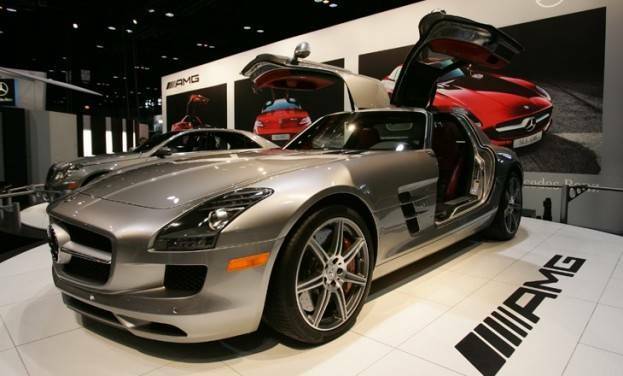 2011 Mercedes-Benz SLS AMG sits with its futuristic doors and enticing body lines at the 2010 Chicago Auto Show. “Camp Jeep” provided an off road experience for those who wanted to take a spin in a new Jeep. The 25,000 sq. ft. exhibit featured a small mountain, rough terrain, steep slopes and lots of simles. Family Day – Monday, February 16th: Manufactures will host an array of activities for the kids, some of which will have an emphasis on safety. Women’s Day – Tuesday, February 17th: Automakers will present an array of topics for women and their automobiles, including maintenance and the differences between leasing and purchasing. Food Drive – Wednesday, February 18th – Friday, February 20th: Three canned good items earns a discount on admission. tickets can be purchased at the box offices, located at the entrances to the show. 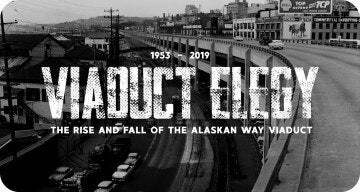 Purchase tickets in advance here. Photography and Video: Yes, anybody is welcome to film and take photos. Do it a lot! Accessibility: Scooter rentals available, along with shuttle and valet service. Push button doors with access ramps and elevators. 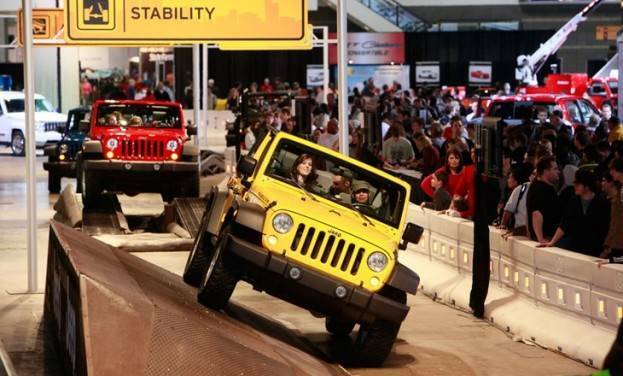 What would you like to see at the 2015 Chicago Auto Show? Share on our Facebook page! No Comments on "Chicago Auto Show: Reflection In Wheels"